For best results, reduce “SCALE” in print menu. 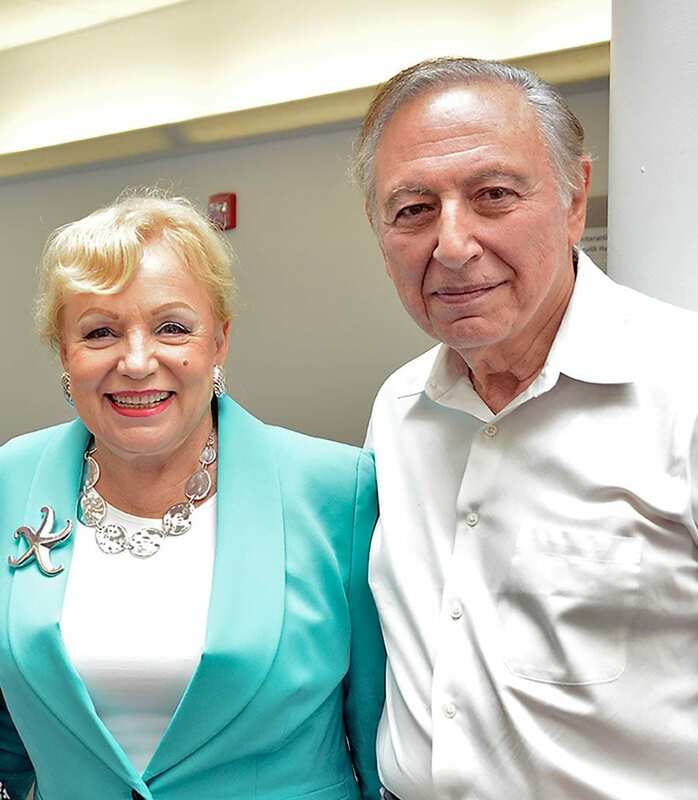 Celebrating a career dedicated to improving global health, biomedical researcher Robert C. Gallo, M.D. ’59 & ’74Hon. and his wife, Mary Jane Gallo, have established an endowed fund that will create exciting service-oriented internship opportunities worldwide for Providence College students. The leadership gift will create the Gallo Global Health Fellowship Program for annual summer internships for students from multiple academic disciplines in clinical settings in the United States and abroad. The endowment will provide a stipend and cover travel costs and other expenses. Gallo is the co-founder and director of the Institute of Human Virology (IHV) at the University of Maryland School of Medicine in Baltimore. He also is The Homer & Martha Gudelsky Distinguished Professor in Medicine and is the co-founder and director of the Global Virus Network (GVN). Gallo became world famous in 1984 when he co-discovered HIV as the cause of AIDS, a mysterious disease that was quickly becoming the deadliest in medical history. 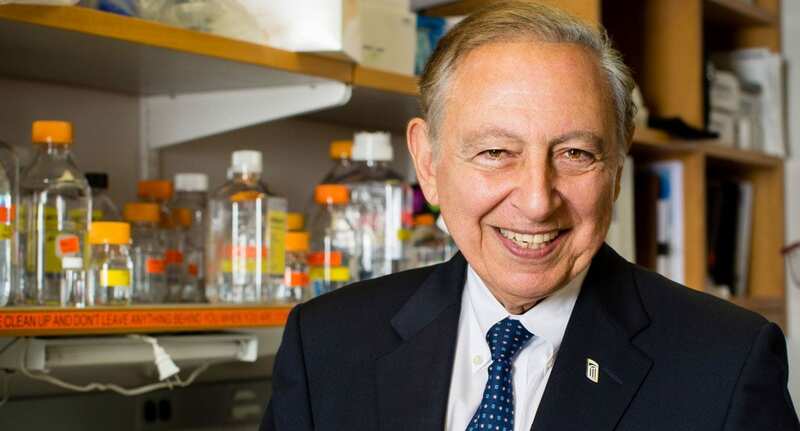 Gallo and his team also led the development of the HIV blood test, which enabled health care workers to screen for the AIDS virus for the first time, leading to a more rapid diagnosis while protecting patients receiving blood transfusions. In more than six decades of biomedical research, he has led groundbreaking work in the diagnosis and treatment of cancer, herpes, and other diseases. Prior to the AIDS epidemic, Gallo was the first to identify a human retrovirus and the only known human leukemia virus — HTLV — one of few known viruses shown to cause a human cancer. In 1976, he and his colleagues discovered Interleukin-2, a growth-regulating substance now used as therapy in some cancers and sometimes AIDS. His research has brought him international recognition as well as election into the National Academy of Sciences and the Institute of Medicine. Gallo said he was inspired to make the gift to his alma mater after learning about a proposal for a fellowship program in global health last March when he visited campus to take part in a Centennial Presidential Speaker Series panel discussion. “This seemed like a very good thing for us to do to help young people … to help stimulate them to help other people in need in the fields of science and medicine. It was one of the most appropriate things for us to be involved with,” he said. According to Dr. Charles R. Toth, associate professor of biology and department chair, who will also chair the fellowship program, the Gallos’ gift will allow students to have the opportunity to work in clinical locations worldwide, including Institute of Human Virology clinics in Baltimore, Haiti, and several African nations, and will be matched according to their interests. “Dr. Gallo’s whole life has been dedicated to global health. The fellowships provide an opportunity for students to get excited about improving global health. This places scientific research within the ethical and moral framework of a Providence College education,” said Toth, who expressed his gratitude to the Gallos for making the fellowship program possible. Dr. Stephen J. 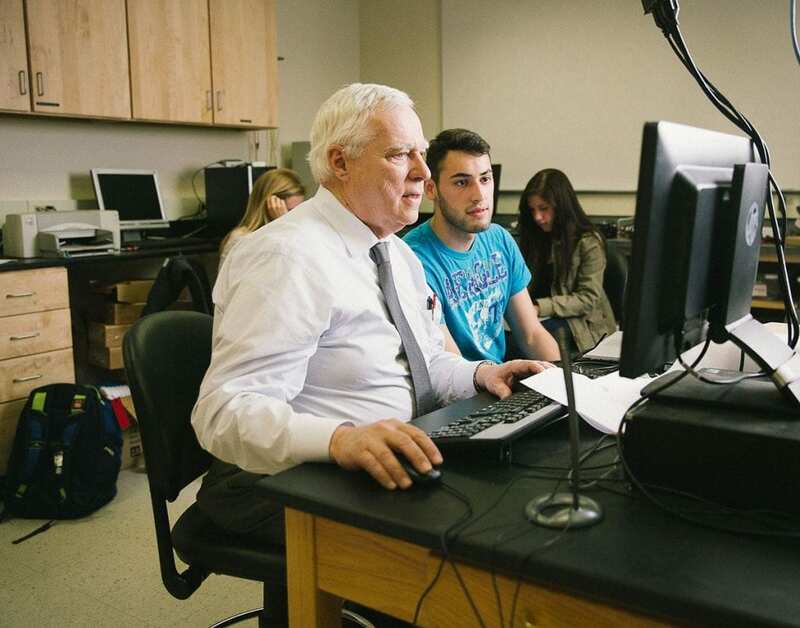 Mecca ’64 & ’66G, professor of physics, left, works in his campus S-Lab with Alejandro Ayala ’17. The first student experiences in the Gallo Global Health Fellowship Program will take place this summer in Ghana under Mecca’s direction. The fellowships will begin this summer with a pilot program to Ghana under the direction of Dr. Stephen J. Mecca ’64 & ’66G, professor of physics, who directs the S-Lab where students conduct research on complex problems in water, sanitation, hygiene, and rural education. In addition, Mecca and his colleagues take students to Ghana each year, often helping to deploy interventions developed in the lab. Two or three students are expected to work in community health clinics and at a refuge for people living with AIDS this summer. The selection process for students and other program details fall under the purview of the Gallo Fellowship Committee. In addition to Toth, members are Dr. Tuba I. Agartan, associate professor of health policy and management; Dr. Nicholas V. Longo ’96, professor of global studies and of public and community service studies; Dr. Terence A. McGoldrick, associate professor of theology; and Mecca. One aspect of the fellowships that appeals to Gallo is that students from any major can participate. The Gallo Fellowships also could help students determine their career path, said Toth and Gallo. Dr. Gallo, right, speaks at a PC Centennial Presidential Speaker Series panel discussion in March 2017. 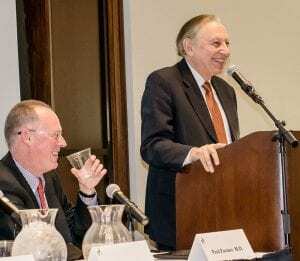 At left is panelist Paul Farmer, M.D., co-founder of Partners in Health. “This is an additional opportunity to find that spark, that transformative moment that gets them excited about what they want to do,” said Toth. In addition, Toth believes the fellowships will appeal strongly to current and prospective students both because of the opportunity to travel abroad and to serve others. “We have a unique population of students. They are not just here for an education. They are here to do more. This program allows them to do something important, to give back. This combines something they’re interested in, academic and career-wise, with a service component,” he said. The fellowships are being launched at an exciting time for science education at PC. The Science Complex is undergoing extensive construction and renovation work in several phases, and the improvements will impact students and faculty in biology, chemistry, engineering, physics, and psychology. A four-story addition to Albertus Magnus Hall is scheduled to open this fall. The Gallo Global Health Fellowship Program gift was made during the recent Our Moment: The Next Century Campaign for Providence College that raised $185 million.